The sun isn’t shining on West Indies cricket. The powerhouse of the sport is now a pitiable shadow of the glory days with the current crop struggling with lack of credentials as well and superior opposition in equal measure. 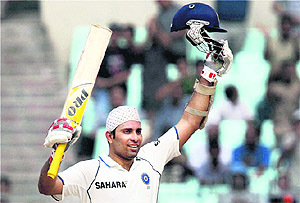 When it is Eden, it has to be VVS Laxman. Five centuries, four of them unbeaten, three in consecutive Tests at this venue - suffice to say this is a match made for each other. The Indian Olympic Association (IOA) has urged Prime Minister Manmohan Singh to clarify the Government stand regarding hosting of the South Asian Games (SAG) in Delhi next year. India and Canada today entered in the semifinals in the pool A matches of the World Cup Kabaddi held at the Nehru Memorial College here. While India beat Afghanistan in a one sided match (50-17), Canada beat Germany (58-19) in the other. India has entered the semifinals by winning all the six matches, while Canada has won five. Right at the outset today there was both good and bad news for the golfers competing in the Hero Women’s Professional Tour. The good news was that the sun was up and about in its full radiance. But the bad news was that strong gusts of winds blowing across the fairways was making the course quite challenging. With many sportspersons, coaches and sports officials backing the National Sports Development Bill, Sports Minister Ajay Maken was in the process making the draft foolproof before putting it before the Cabinet Committee. The previous draft had seen many senior Cabinet Ministers like Sharad Pawar and Praful Patel vehemently oppose the draft and refer it back to Maken for making many changes. Following an increasing number of dope-tainted cases hitting the Kabaddi World Cup, the Punjab Government is in for another embarrassment with the anti-doping team head asking for security following a threat to his life. The sun isn’t shining on West Indies cricket. The powerhouse of the sport is now a pitiable shadow of the glory days with the current crop struggling with lack of credentials as well and superior opposition in equal measure. Their gloomy fortunes were reflected by the lowering skies and dismal mist that enveloped the City of Joy as nature too joined in to mourn their impending demise. While the light was never good in the city, there was nothing dim about the manner in which the Indian batting went about in its business. Another fine hundred from VVS Laxman and a blazing century from Mahendra Singh Dhoni enabled them to declare at 631 for seven on Day Two of the second Test, Laxman remaining unbeaten on 176 and the captain scoring 144. The Caribbeans, hammered into submission on the field, were struggling at 34 for two when the weather closed in and bad light stopped play, with 12 overs left to bowl. Laxman’s Eden sojourn is a collectors’ item. The Hyderabadi has scored five centuries at Eden now and only once has been dismissed, that coming in that legendary 281 against Australia in 2001. Even today, he wasn’t ever going to be in trouble, barring an odd inside edge and it was just a matter of time before he reached three figures this morning. By the time Dhoni declared, about 15 minutes after tea, Laxman had been at the crease for 394 minutes, having faced 280 balls and found the boundary 12 times. Lazy elegance at its champagne best. There is nothing elegant about Dhoni. But his effectiveness as a quick scorer has been established time and again. The West Indies attack wasn’t going to be much of a challenge and he went about accumulating runs as only he can. The West Indies, always on the backfoot, paid for their indiscipline dearly. Dhoni was caught behind twice - on scores of 13 and 16 - both times off Kemar Roach. But on both occasions, the fast bowler overstepped and the Windies fielders crumpled to the ground in disbelief. This attack is hard-pressed to get wickets but to get a hitter like Dhoni twice, of no-balls, was a disaster. Dhoni thereafter made them pay. He clobbered the bowling around with his own brand of orthodox, unorthodox and disdain. 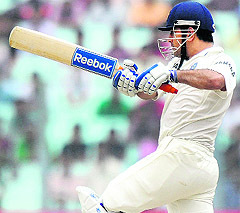 Ten boundaries and five huge sixes came off his bat as India began their race to pile on the runs. But while he does have the weapons, Dhoni’s captaincy sometimes leaves one wondering. He could well have declared at tea, with India on 613 for six, but hung around till after the break. Dhoni edged Roach to Carlton Baugh again and this time the delivery was legal. But he still waited and Ravichandran Ashwin came in to bat. But soon thereafter, the innings was called off. What was achieved by playing a few extra minutes is best left to Dhoni’s plans. The West Indies were dented straightaway in their innings. Umesh Yadav’s searing delivery caught the edge of Adrian Barath’s bat and Virender Sehwag took a sharp catch at second slip. Kraigg Brathwaite escaped once when substitute Virat Kohli dropped a sitter at short-leg off Ashwin, but the off-spinner was given the wicket later, as Brathwaite was adjudged caught at short-leg by Gautam Gambhir. The West Indies are in trouble and little seems to be going their way. With 64 minutes of play lost in the day, including 19 before lunch, play begins at 8.30 a.m. tomorrow. Maybe the weather will come to the visitors’ aid again. Bowling: Fidel 22.2-1-81-1, Sammy 25-0-132-2, Roach 26-1-106-2, Samuels 27-0-104-0, Bishoo 45-2-154-1, Brathwaite 6-0-43-1. Bowling: Ojha 6-2-10-0, Yadav 1-0-3-1, Ashwin 5-2-21-1. Asked if he rated his innings in terms of satisfaction, Laxman said: “I am not one who rates my innings but any knock that you contribute to the team is always good. Hopefully, this knock will help the team win the game. I rate any knock which helps the team win more valuable than making runs in a losing cause. The wicket is already turning and there is good bounce for the spinners. Hopefully, our bowlers can bowl in the right areas and we can win the game. “Definitely it was a relief to get a hundred,” the Hyderabad batsman said about invariably batting for big scores when the team was in trouble. “The last hundred I got was against Sri Lanka in the last Test match at P Sara (Colombo) where the team was under tremendous pressure. After that, I have played knocks in pressure situations. Luckily, in this Test match, Sehwag and Gautam gave us a good start and obviously Rahul and Sachin had a good partnership. When I went in to bat, the position wasn’t very challenging but it was important for us to build a partnership at that stage and that’s what me and Rahul tried to do. The Indian Olympic Association (IOA) has urged Prime Minister Manmohan Singh to clarify the Government stand regarding hosting of the South Asian Games (SAG) in Delhi next year. In a letter to Dr. Singh, IOA acting president Vijay Kumar Malhotra requested the PM to immediately convene a meeting with Delhi Chief Minister Sheila Dikshit, Sports Minister Ajay Maken and the IOA officials to take a decision on SAG. The letter clarified that the IOA did not make any bid for these Games and they were allotted to India “because of the rotation system”. SAG, earlier known as the South Asian Federation (SAF) Games, are part of the SAARC Charter “according to which, the Games have to be rotated amongst the member states”. “As per Article 12 (4) of the South Asia Olympic Constitution, the National Olympic Committee (NOC) of the country on which the responsibility of the celebration of the Games fall, shall organise the Games on its own or it may delegate this authority to an Organising Committee, which shall act under the guidance of the NOC,” Malhotra explained in his letter to the PM. He said the meeting, to be presided by the Prime Minister, needed to be convened to discuss the planning and conduct of the Games “which is a National commitment, because India is a founder-member of SAARC”. Also, US and UK girls teams ended in draw (36-36) while England beat Nepal (63-18). In the first match between US and UK, UK made an impressive lead, however US then managed to get two points on technical grounds as one of the player from UK was absent from the playground. US got an extra point in the first half and second point in the second half. UK raiders Laoumi Minius and Miss Terssia got 5 points each. US raider Gurumrit Khalsa got highest points (9) while Sarbshakti Khalsa got 5 points and Gurusuria got 4 for her team. In the men’s first match between England and Nepal, England surged ahead even before half time (36-9). England’s raider Jaspal Singh Pali and Gurdev Singh got 15 points each while Aman Johal and Amandeep Singh Deepa scored 7 each. India continued its winning spree by beating Afghanistan. Indian players showed their authority even before the half time when the score was in favour of India (30-5). Indian raider Sandeep Dirba pocketed 10 points, Tanwinder Singh Sonu got 9 and Sukhbir Singh Sarawan scored 8 points for the team. The US men’s team, which refused to give dope test during yesterday’s kabaddi matches in Hoshiarpur, has been placed out of the world cup. In a press release issued by the Punjab government, it is stated that the team has been shown the door as its players refuse to undergo a dope test. The US team was at the top in pool B matches and managed to enter semifinals. The release stated that the National Anti Doping Agency (NADA) and doping control committee is conducting dope tests on two players everyday. But Nalini Singh Siwach was revelling even in these challenging conditions. She ended with the best round of the day with one-under 72 and now has a net score of 147 after two rounds. In the process, Nalini overtook yesterday’s leaders Sharmila Nicollet and Saaniya Sharma. Bangalore’s Sharmila ended the second round at four-over 150. On the fifth hole today, she made a double-bogey and then she spoiled her score further on the eighteenth with another double-bogey. On the other hand, local golfer Saaniya made five-over and ended the day at a score of 151. For sure, it took time for Saaniya to find consistentency in her shot-making today as she made a double-bogey on the opening hole. But she soon was back in her stride with a birdie on the next hole. The tussle has always been between the tours two best golfers, Saaniya and Sharmila and both pose tough competition to each other, but Saaniya seems to enjoy her duels with Sharmila every time. “We always have fun when we play together so I don’t see any competition. I did mess up my score on the first and the last holes but I enjoyed my game overall,” Saaniya said after the day’s play. Saaniya has come back after a long injury break but slowly she is getting back into her rhythm. “It is very painful while playing because I am suffering from a cartilage injury and have a strain in both my ankles. But I am not going to sit back because golf is what I enjoy the most and I only want to play. I am not planning to take any position here but I just want to finish this leg." But this time, Maken is sparing no effort to make it loophole-free so that it gets the Committee’s nod before being introduced in Parliament. “Once the bill comes to Parliament, I am confident of its passage,” Maken had recently. He said the draft was being given final shape, which will be completed in a fortnight. But in the meanwhile, he has got support from many quarters, expressing their support for the proposed bill, which he hopes to put before Parliament in the coming winter session. Though age and tenure limits are major contentious factors in the bill, being opposed by many of the National Sports Federations (NSFs) and the Indian Olympic Association (IOA), Maken’s challenge will be to bring the Board of Control for Cricket in India (BCCI) under the bill’s ambit and under the Right to Information (RTI) Act and to ensure at least 25 per cent representation for sportspersons in each NSF. Maken is keen that the reins of the federations are controlled by sportspersons, which could be ensured only if they have a substantial representation there. This clause has got wide support not only from sportspersons but also from over 28 NSFs, who have written to Maken pledging their support. He earned the goodwill of the sportspersons and coaches when he cleared all the backlog of pending payments of award money due to them. He also promised that henceforth, two functions will be held in the space of six months every year to honour medal winners in international competitions. He is also set to create another constituency of faithful supporters with his announcement to reward the traditional coaches who do talent-spotting and initial grooming before the athletes graduate to greater level of scientific coaching. So far, the cash rewards were hogged mostly by the National coaches who are in the spotlight, without the grassroot moulders getting any incentive. Maken is determined to set right this anomaly by chalking out a reward scheme for traditional coaches as well, which the minister formally announced while distributing over Rs 8 crore to sportspersons and coaches at the National Stadium here yesterday. (Earlier, the Government used to honour the traditional coaches with the Dronacharya Award, which benefited veteran traditional coaches, like the late wrestling coach Guru Hanuman and Capt. Chandroop). Following an increasing number of dope-tainted cases hitting the Kabaddi World Cup, the Punjab Government is in for another embarrassment with the anti-doping team head asking for security following a threat to his life. Confirmed sources told The Tribune that director, Anti-Doping Committee, Kabaddi World Cup, Dr Munish Chander, approached the senior functionaries of the organising committee of the World Cup claiming that his life was in danger following almost three dozen dope positive cases. “He received certain phone calls and was an eye sore for numerous players who actually blamed him for the dope controversy”, they said. Interestingly certain officials attached with the teams were also feeling threatened by Dr Munish’s deeds who was taking selective sampling in all matches. Sources said following increasing threats security had been given to Dr Munish. “I have been provided with two armed policemen following my request for the same as I was not feeling comfortable after the increasing number of dope cases in this tournament”, Chander told The Tribune. “I have brought the matter to the notice of the concerned officials and it is over for now, though someone informed me about threat to my life and I decided to take that advice seriously”, he added. Speaking on the issue, NADA Chief Rahul Bhatnagar said that ensuring the security of anyone appointed to check doping is of the organizing committee and I am hopeful that they do their duty,” he said.